IK Multimedia’s T-Racks mastering suite is a modular program: basic core functionality is free, and users build up a collection of tasty processors by making in-app purchases from the company’s Custom Shop. 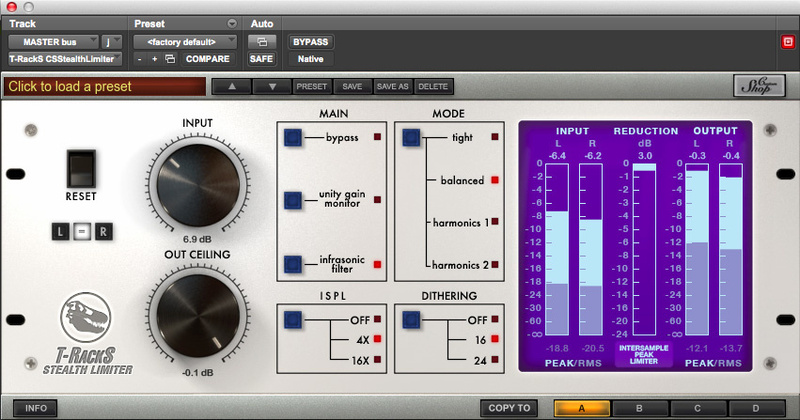 The latest tempting morsel that IK have set before their customers is the Stealth Limiter, a mastering limiter which is claimed to preserve musical dynamics even when performing heroic feats of gain reduction. To get Stealth Limiter, you first need to install T-Racks itself — which, at almost 1GB, is a larger package than some DAWs — before clicking on the Custom Shop button. Here, you can trade money for Custom Shop credits, and credits for T-Racks modules; 125 credits are required to purchase the Stealth Limiter. Once activated, it’s available as a self-contained plug-in or as a module within the stand-alone and plug-in versions of T-Racks. Stealth Limiter’s controls will be familiar to anyone who’s used a mastering limiter before. The Output Ceiling control would usually be left in its default -0.1dB setting, and the bulk of the work is done using the Input gain dial. A button labelled Unity Gain Monitor lets you easily A/B the processed against the bypassed sound without level changes, and there are also dither and oversampling options (but you’ll need a fast computer to use the 16x option!). What’s less usual is a button that switches between four different modes labelled Tight, Balanced and Harmonics 1 and 2. There is a perceptible difference in the sound of these modes, especially between Tight mode and the others. In Tight mode, Stealth Limiter seems to behave in quite a similar way to other mastering limiters I’ve used; switch to Balanced, however, and the sound of a busy mix really opens up. Compared with FabFilter’s fine Pro-L limiter, which is my usual first choice, I was often able to squeeze another dB or two out of the same mixes before limiting artifacts became audible. In its impressive ability to retain the punch and impact of transients, it beats anything else I’ve heard apart from Slate’s pioneering FG-X. At this price Stealth Limiter is a bargain: it’s definitely a must-have for anyone who’s already a T-Racks user, and should convert plenty of new followers to IK’s suite. Highly recommended.